Hakone Yumoto Onsen (箱根湯本温泉) is the One of Hakone Onsen town located in Kanagawa. Hakone Yumoto Onsen is located at the entrance of Hakone Onsen, approximately 1 1/2 hrs. from Tokyo. 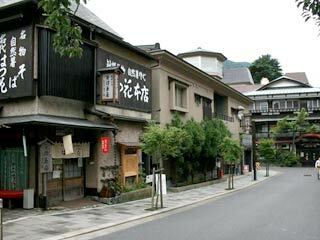 It is the biggest Onsen town in Hakone with many Onsen hotels, restaurants and gift shops. There are many public Onsen, but few parking. 0. at Hakone Yumoto Station. The history of Hakone Onsen began with Hideyoshi's attack of Odawara Castle. He used Hakone Onsen for healing his soldiers. Also, Tokugawa Iemitsu used this onsen for you bath room. Hakone Yumoto is very famous for its Ajisai, Hydrangea. In the end of June, many people visit Hakone Yumoto to enjoy Ajisai. There are many hiking courses which you can enjoy Ajisai, and Hakone Tozan Line is popular as the Ajisai Train.